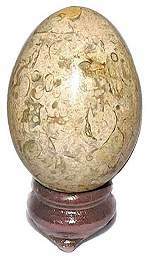 These smooth SilverLeaf Jasper Eggs have an amazing variety of etch style, linear patterns in grounding earth hues of sage, chartreuse, cream and light to dark green. SilverLeaf Jasper is a Thinker's Stone and has been used to understand complex, counter intuitive truths that underlie age old problems and issues which defy resolution. The Walnut Finish Egg Stand is included. Jasper is an opaque form of Chalcedony, and has been a stone for kings and shamans. Dalmatian Jasper has unusual contrasting brown and black spots amid a creamy matrix. This stone enhances the sense of brotherhood, goodwill and benevolence, as well as reminding Dalmatian owners of their loving pets. The Walnut Finish Egg Stand is included. 50mm or 2 " L by 1 1/2"W - 3.5 ozs. Ancient fossils, once organic creatures have merged with jasper stone to preserve a window into the past. Fossils are a bridge to prior worlds and bring the mystery of the past a little closer. These eggs are from Pakistan and have an appealing cream matrix with interesting swirling shapes. Oriental Wood Egg Stand is included. Jasper is an opaque form of Chalcedony, and has been a stone for kings and shamans. Dramatic Brecciated Jasper has a variety of colors including creams, reds, browns and clear areas which always have a unique appearance and high shine. The Walnut Finish Egg Stand is included. New, large 70mm Birdseye Jasper Eggs from Mexico have amazing fossil shell swirls and circular bandings in an earth palette of beige, brown and cream. Also known as Orbicular Jasper by crystal masters, this stone has been used for meditation and breath control as well as mental cleansing and detoxification. The Walnut Finish Egg Stand is included. 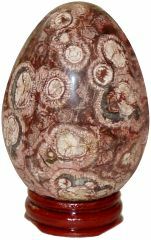 These spectacular Fancy Jasper eggs are bursting with colors and patterns that only Nature can conceive. Jasper is an opaque form of Chalcedony and has been a sacred stone for kings and shamans, believed to ward off negativity and give protection. The colors vary widely from light to dark shades. The Walnut Finish Egg Stand is included. Newly restocked, these Ocean Jasper Eggs have colorful orbicular formations and quartz crystal inclusions which are always unique. Also known as Orbicular Jasper, it has been used by Crystal Masters for meditation and physical healing. The Walnut Finish Egg Stand is included. Extremely rare Polychrome Jasper eggs from Madagascar have a superb lustrous polish with a dazzling mix of hues, from burgundy and gold to muted greens and earth tones. Jasper is a mystical stone of justice, said to be highly protective and to rectify unjust circumstances. Jasper is an opaque form of Chalcedony and has been a stone for kings and shamans. A Grade polished Polychrome Jasper eggs from Madagascar. The Walnut Finish Oriental Stand is included. Red Snakeskin Jasper is said to be a stone of justice, assisting to rectify unjust circumstances. It is also thought to be protective. Jasper belongs to the quartz family known as Chalcedony. Lovely 50mm or 2" egg comes with a Walnut Finish Oriental Stand. Red Wave Jasper has elaborate bandings and swirls, in an earth palette of red, brown and gray, that is reminiscent of labyrinth formations. Also known as Bruneau Jasper in Gem Lore, this stone is believed to enhance practicality, positivity and perception when the best outcome is desired. The Walnut Finish Egg Stand is included. Life imitates art, each of these amazing Picasso Jasper eggs can be an abstract canvas! Jasper is an opaque form of Chalcedony, and has been a stone for kings and shamans. The Walnut Finish Oriental Stand is included. 2 " L by 1 1/2"W - 3.5 ozs. Picture Jasper exhibits the spectrum of creams and browns. It is a mystical stone, said to stimulate creative visualization and increase global awareness. Jasper is an opaque form of Chalcedony, and has been a stone for kings and shamans. The Walnut Finish Oriental Stand is included. Unusual Black Picasso Jasper Eggs have shiny black and charcoal hues with interesting striated formations, very much like an abstract canvas! Picasso Stone helps crystallize intuition into a tangible, creative inspiration which can fuel originality and vision. The Wood Egg Stand is included.